In anticipation of dangerously low temperatures beginning on Tuesday, Jan. 29, the City of South Bend, with support from the Red Cross of Northwest Indiana and the St. Joseph County Emergency Management Agency, has opened the Charles Black Community Center as an emergency warming center from 9 a.m. Tuesday, Jan. 29 through 8 p.m. Friday, Feb. 1. The warming center is intended as a place for individuals and families who experience loss of heat in their homes during this time. 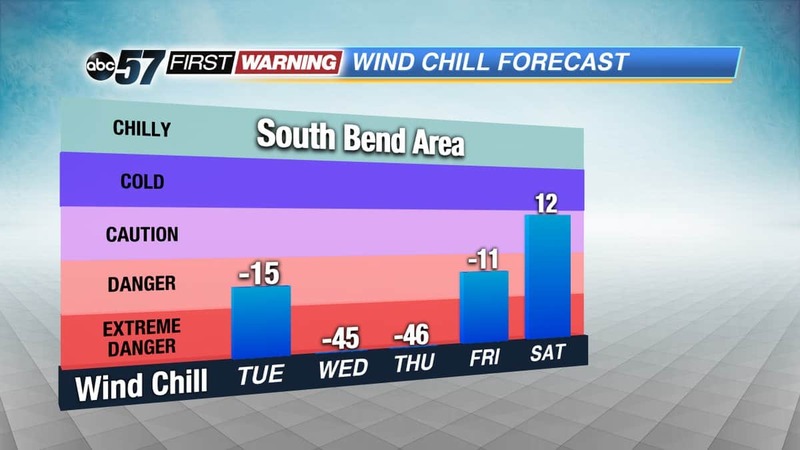 The City of South Bend will also be limited to essential city services from 12 p.m. on Tuesday through 12 p.m. on Thursday, though emergency services such as police and fire will be in operation. Residents with questions or in need of non-emergency help can call 311 from 7:30 a.m. until 5 p.m. Individuals and families experiencing homelessness are still encouraged to use overnight winter amnesty resources at area providers, which are best equipped to meet their needs. Due to the extreme conditions, the winter amnesty sites at Tutt Street operated by Hope Ministries and the Center for the Homeless at their downtown location will not turn any individuals away for overnight shelter. 1/29 9 a.m. – 6:30 p.m.
1/30 9 a.m. – 7 p.m.
1/31 9 a.m. – 6:30 p.m. Residents are asked to contact the Elkhart County Sheriff’s Office assistance if they need shelter or know of someone who needs shelter. Transpo will be running fixed routes without charging fares from Tuesday through Thursday. Residents and local groups interested in providing volunteers or assistance can contact the St. Joseph County Emergency Management Agency at 574-235-9358. South Bend Animal Care and Control is reminding residents that all animals must be indoors during these extreme temperatures. Residents who find animals outside should call 574-235-9303. For more cold weather tips, the St. Joseph County Health Department has information available at sjchd.org.